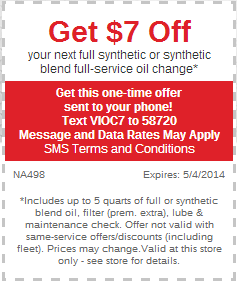 Valvoline Instant Oil Change is a company that focuses almost entirely on providing the fastest oil changes possible. The shops are setup so that you can drive in and drive out quickly with no hassles. 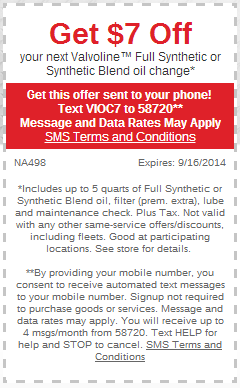 Each shop is franchise owned, but you can still get Valvoline coupons that work at every location. 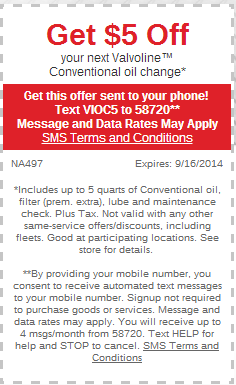 Southern California locations that were formerly EZ Lube stores are also getting coupons for oil changes. 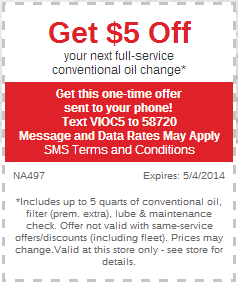 Other services available at Valvoline Instant Oil Change (VIOC) are services on air filter, serpentine belt, transmission, fuel system, battery, tire rotation, air conditioner and radiator.